Welcome to Jed, who found the group. Ciuin is proofing a 60-page document for her editor. And she has made up her 2013 reading list. What’s in a name? Writer’s Digest offers some rules for picking the names of your characters. Cynthia VanRooy give some more advice on names. Scott Nicholson has more on the subject. And while we’re thinking of names, consider whether you need all those characters to be named and developed. The schedule has been shifted to deal with the missed meeting. Apologies to Nick for assuming he would miss a 4th Thursday when now I understand that is not the case, but I’m going to stick with my first attempt. That means you already have Janice and Tyree’s material and only need Ciuin to send hers. Small bookstores seem to be holding up despite the attention on e-books, according to this NY Times article. Ever been confused by all the variations on pasta? Now there is a book describing over 200 of the shapes, complete with mathematical formulae for the shapes. Just the gift for the technogeek/foodie in your life? 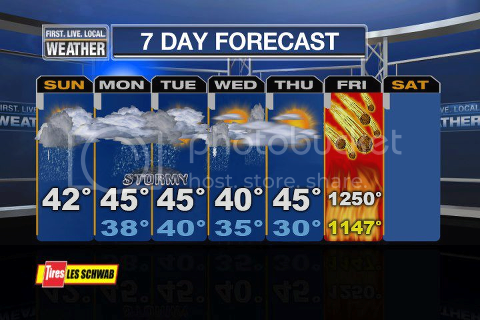 We survived a blizzard and the Mayan version of Y2K this past week, and escaped with only a messed-up schedule. With the hoopla about the end of the Mayan calendar, we’ll have some thoughts on endings. Writer’s Digest gives some advice on the ending of your novel. It’s important to get it right. Remember, Hemingway wrote 39 endings to Farewell to Arms. The NY Times released their list of 100 Notable Books of 2012. And at the end of November with 1/12 of the year left to go, even. Ciuin is on school break and has lots of time for writing and reading (and movies). She finished reading a book this week and thereby has met her goal of 10 for the year. Tyree is turning Sams Dot over to the White Cat people and will have more time for writing. Jennifer R. Hubbard writes about balancing supporting characters and their subplots against the main plot. They can make a story more interesting, but can also get in the way. Mary Lynn Mercer says you shouldn’t have too many subplots, and they should connect to the main story. She has other good points to make. Lee Masterson recommends using some subplots, and Kristin Bair O’Keefe gives seven specific things that subplots should do. Amazon announces their 2013 Breakthrough Novel contest for manuscripts of 50,000 to 150,000 words. Submissions must be made between January 14 and 27, following detailed rules for the submission process. Big rewards for the winners. There are five categories this time, and some of them will fill up fast. Dylan got fan mail – someone liked his serial and sent him a water color portrait of one of the characters. He also got another commission. Ciuin is getting a good grade for the semester (maybe an A) in Journalism class, and got a nice dedication and autograph from the professor on her copy of his book. It’s all in how you look at it. A good writer can describe the same thing in multiple ways to suit the mood. Heinlein has a famous quote that goes something like, “Which would you rather have? A nice, thick, juicy, tender medium-rare grilled steak-or a scorched piece of bloody muscle tissue from the corpse of an immature castrated bull?’ Restaurant menus are loaded with positive words, often irrelevant ones. Tom Sawyer was able to favorably describe his fence painting chore. Tyree points out an opportunity for submitting to a self-styled pulp publisher named Pro Se Press. (Pro Se, prose, get it?) They publish stories about otherwise unknown superheroes, explorers, werewolves, Men’s Men and Femme Fatales. Go to their blog page and scroll down to Nov 18 for details of a current opening, and here for other openings. Tyree reports his Sams Dot division of White Cat Publications has five titles out as ebooks and sales are good, with WC asking them to get more out in e-formats. Do you understand the usage of raise and rise? Since and because? Insure or ensure? Several other pairs of confusing words are linked in the first article.